Casuarina (cas-ewe-ah-REEN-ah) equisetifolia (ek-wee-set-ee-FOAL-ee-ah) takes its name from the foliage resembling a horse’s tail. 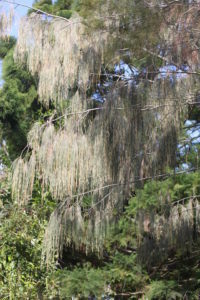 This graceful drooping tree grows 6-8 metres and “sings” in the breeze. It produces reddish brown flowers (male and female flowers on the same tree) in March-May, followed by bird attracting seed pods. The Coastal She-oak grows naturally on ridge tops of frontal dunes, from the Gulf of Carpentaria Qld to northern NSW. It is also seen on most Moreton Bay islands. Tolerant of S/E ocean winds and salt, it is ideal for windbreaks & dune stability in a garden nearby the the sea. The Coastal She Oak grows in sandy soil, in full or filtered sun. Local indigenous uses included spear making, seeds roasted to supply salt, stems were chewed to alleviate thirst, and the bark was used to treat diarrhea and dysentery. Casuarina equisetifolia flowers attract Rainbow Lorikeets and bees, while the seed is enjoyed by the endangered Glossy Black Cockatoo.